We'll deal with the fiddly drivers etc. Excellent scanner for the price, very compact, speedy and very easy to set up. Would recommend. With an industry-first slow mode1 for scanning crumpled or fragile documents, the ability to scan challenging media has never been easier. The Active Separation Roller System prevents tedious document double feeds and the Double Feed Detection Skip (DFDS) means you can scan difficult media like envelopes or documents with post-it notes. Auto Scan Mode enables the processing of a vast number of documents as one file. Single-pass double-sided scanning ensures rapid document processing, while it's possible to scan a versatile array of media such as paper as thin as 27gsm, or thick card at 413gsm. The instantly-recognised A3 carrier sheet automatically stitches larger documents back together digitally. Scan documents easily to mobile, tablet and Wi-Fi-enabled work stations with its wireless capability. Built-in NFC enables instant Wi-Fi connectivity. It has high-speed USB 3.0 with TWAIN and WIA drivers for enhanced compatibility with Document Management Systems. 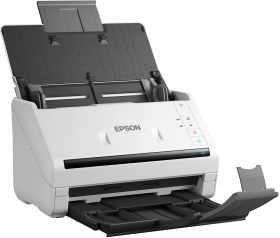 Epson Scan 2.0 software makes it easy to edit images with features such as de-skew and auto rotate, while Document Capture Pro3 is the easy to use solution for capturing and storing electronic documents at the touch of a button. Quickly process physical documents in manageable amounts. ¹ Prices checked on retailers' websites on the previous day. Whilst we are confident these prices are correct we accept no responsibility for any inaccuracies. Prices based on single, on-line purchase of the same or closest equivalent product, excluding delivery. Promotional prices may vary.